Be Yourself - Nobody Can Do It Better. Be Yourself – Nobody Can Do It Better. When you’re in your formative years of becoming a professional footballer, there are lots of different opinions, coaching points and personal critique that are heaped on you by others who want to comment on the way you play your game. The important question is – who do you actually listen to? Really there is no correct answer to that – the key is a balanced perspective and a constant emphasis on the positive. I found that the key to me having success was being confident in the player and person I was, no matter the task or opinions thrown my way... easier said than done. When I was 16 years old, I was a boring lock-down defender that didn’t take many risks and I wasn’t super confident with a ball in my hands. After two years and a bit of growth – both physically and from a football IQ sense – I was 18 before I started to take hold of games and play genuinely good football. After being drafted as a tall running half back/mid-fielder, I thought I was going to be the next Andrew Embley or Anthony Koutoufides. But with the step up in the talent around me and greater competition for spots, I was thrown all over the ground. Wing, half-back, forward, tagger… the only position I didn’t try was ruck. Over a two-year period, this created so much uncertainty within me about who I was as a player and what I was good at. Because I was getting new coaching points and tasks every week to correspond with the changing roles. I lost who I was as a player – then I went from being an All Australian as an 18 year-old to borderline delisted after just three years. I had to want to be the best Alex Rance I could be. That was something I would always be best at. Because I had been so lost in the wilderness of different roles and taking in everyone’s opinions and coaching points it took me a while to work out what they were again and who that player was. So, after a few days of thinking, I found that I was physically really strong in the gym, very competitive and would never give up – and had above-average speed and endurance. So they were my building blocks. I would say to myself, “OK Alex, put yourself in as many opportunities as you can to use your strength, endurance and power.” With a little fine-tuning of my footwork I started to get some really good results. Once i felt comfortable with that part of my game, I started to build on that. 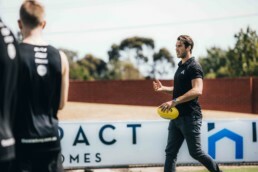 “How can I get in more opportunities to use my strengths?” I wanted that ball in my hands more, which led to me adding offensive confidence to my game. And as the weeks rolled by, I started accumulating evidence of the player that I wanted to be – and could be – just based off the simple strengths that I knew I had. But, remember, it took time and wasn’t an overnight fix. So often, when you’re a young, hungry athlete, you want to please everyone – often at the detriment of your own mental health and game standard. I found that the key to me having success was being confident in the player and person I was, no matter the task or opinions thrown my way… easier said than done. and make that bulletproof. Even write this down as a constant reminder. This is what will make you great. whose opinion and knowledge you value over all else and work with them. Try to keep it a simple as possible. a player but always remember that, at your core is your X factor. Work on your weaknesses but work even harder at your strengths. If I was always trying to be Andrew Embley or Anthony Koutoufides, I was always going to be second best – because they were the best versions of themselves. I had to want to be the best Alex Rance I could be. That was something I would always be best at. Know what is your X factor – Something that no one can take away from you and make that bulletproof.